How can fevers be prevented? Fever is a rise in body temperature. Fever is a symptom, not a sickness. Fever says that there is something wrong and that the body is trying to take care of the problem. Your child has a fever if rectal temperature if over 100.4 degrees F (or 38 degrees C). Your child has a fever if oral (mouth) temperature is over 99.6 degrees F (or 37.6 degrees C). Your child has a fever if axillary (armpit) temperature is over 98.6 degrees F (or 37 degrees C). A normal temperature is 97-100.4 degrees F (or 36-38 degrees C). Fever is a symptom of an illness. Fever is how the body fights a viral or bacterial infection. No. Fevers are not contagious. How do I use a thermometer? Always wash the thermometer with warm water (not hot) after you use it. You can clean it with soap or rubbing alcohol. Rinse with cool water and dry. Put the thermometer in a place where it can't break and where your children can't reach it. Glass thermometers costs less than other thermometers. They can break easily, can be hard to read, and your child has to sit still for a long time while you take his temperature. There are two types of glass thermometers. Oral thermometers have a slim long bulb. Rectal thermometers have a round short bulb. Oral thermometers are best. Shake the thermometer before and after each use. The mercury (dark line) should be below where the numbers start before you use it. Take your child's temperature (see instructions below). Hold the thermometer at eye level to read it. Turn the thermometer slowly until you can see the mercury (black line). There are long lines and short lines on the thermometer. Read the number closest to the long line first. Above, the top thermometer is 100. Count how may short lines the black line goes past. Above, it goes past 2 short lines. The temperature on the top line is 100.2. If the black line goes past 3 short lines, the temperature is 100.3. A digital thermometer costs more than other thermometers. It needs batteries but works fast. Your child has to sit still for a short time while you take his temperature. Put the tip in your child's mouth or under his arm. Hold it in place until it beeps or until the numbers stop changing. The numbers tell you what your child's temperature is. A tympanic thermometer costs the most of all thermometers discussed here. It also needs batteries but works fastest. Your child has to sit still for a short time while you take his temperature. Turn it to the right switch. If you are going to take your child's temperature in the ear, the thermometer should be on "ear" or "oral". If you are going to take his temperature in his bottom, it should be on "rectal." Using this thermometer in his ear is best. Put the thermometer in your child's ear. Press start. Hold for one second. The number in the window tells you what your child's temperature is. How do I take my child temperature? Feeling your child's forehead, face, or stomach is NOT a good way to tell if he has a fever. You must take your child's temperature with a thermometer (not temperature strips or pacifier thermometers) to be sure he has a fever. There are different ways to take your child's temperature. Use the way that is best for your child's age. Never leave any child alone with a thermometer. Taking his temperature rectally (in his bottom) is not easy to do safely. 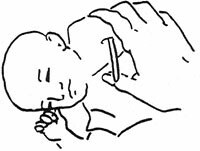 Taking your baby's temperature under the arm (axillary) is best. Put the tip of the thermometer in the middle of the armpit. Hold it with one hand and use the other hand to keep your baby's arm at his side. Keep the thermometer in for 3-4 minutes. Take temperature by mouth (orally) if child will let you. Be careful that younger children do not bite the thermometer. If your child just had something to drink, wait 10 minutes before taking his temperature. Have him lie or sit down. Put the thermometer under his tongue. Tell your child to close his lips but not to bite. Keep the thermometer in for 2-3 minutes. Fevers can be treated with or without medication. If your child has had a febrile seizure (seizure during a fever) he should have medication every time he has a fever. If your child is still eating, drinking, and playing, he may not need medication. Dress him in lightweight clothing or have him take off his clothes so he loses heat through his skin. Cover him in a light blanket if he is cold or shivering. Keep your child quiet. Activity could make his fever worse. Give him extra fluids (such as water, Popsicles, Jell-O, or juices). If he doesn't want to drink, give him whatever fluids he will agree to. Medication may help your child feel better but may not stop the fever. Give Acetaminophen (such as Tylenol, Tempra, or Panedol) every four hours. Read label and follow directions. Give your child the right amount for his weight and age. Check with your doctor before giving Ibuprofen (such as Pediaprofen, Motrin, or Advil). Do not use aspirin for fever. It can cause serious illness, especially if your child has chicken pox. Your child may need a sponge bath if he has a fever over 104 degrees F (or 40 degrees C) and it has not gone down 30-60 minutes after getting medication. Use lukewarm water, not cold water. Never leave a child alone in the tub. Stop the bath if your child starts to shiver. Do not use rubbing alcohol on your child's skin. It can cool him too fast or give him alcohol poisoning. A fever should not last more than three days. Call your doctor if your child's temperature will not go down. The body's temperature varies throughout the day. It normally goes up in warm weather, after exercising, after drinking hot liquid, and when wearing heavy clothes. Having a fever is a sign that the body is fighting infection, so you don't want to prevent it. Watch your child's symptoms to make sure the fever is okay. Read below to learn when to call the doctor. Call the doctor if your baby is under 3 months old and has a temperature. Call the doctor if your child has a temperature of 103 degrees F (or 39.4 degrees C) or higher. Call the doctor if your child has fever and a loss of appetite, headache, vomiting or stomach pain, is fussy, sleepy, or crying more than usual, can't swallow, has a sore throat, a hard time breathing, ear pain, or pain with urination. Fever is a rise in the body temperature. There are generally three different types of thermometers; glass, digital, and tympanic. There are different ways to take your child's temperature. Use the way that is best for your child's age. Most children do not need medication if they have a fever. Medication won't stop the fever but it may help your child feel better. A fever should not last more than three days. Call the doctor if your infant has a fever or if your child has other symptoms with his fever. American Academy of Pediatrics. Fever. Guide to Your Child's Symptoms 1997; 76-77.